June National Safety Month has finally made its arrival! Parents know that they can never take too many precautions in making sure their little ones are safe throughout day-to-day life. That said, moms and dads are always on the lookout for parenting innovations that place great importance on safety and health benefits for kids. Luckily, top-rated parenting brands like DockATot, Ollie Swaddle, Lorena Canals, Finn + Emma, BubbleBum, and Bambino Mio all offer essentials that will improve the safety and health of kiddos (and give parents peace of mind). Whether it’s a trip to the local beach or a cross-country road trip, the below innovations will play a great role in keeping little ones safe this summer and beyond. Parent-favorite DockATot gives a busy parent the perfect place for baby to comfortably relax, play, get in tummy time, and sleep with its innovative shape and design. It helps parents always ensure baby is safely contained and close by at all times, whether the family is at the park, in the hotel, or at the beach this summer. DockATot answers the needs of multitasking parents who crave a snug and safe spot for little ones anytime, anywhere. It’s even perfect for travel—it’s lightweight, portable, and goes anywhere, anytime. All materials are hypo-allergenic and sourced from top-quality suppliers and are Oeko-Tex certified. Must-Have Designs for Summer: Minty Trellis, Coral Trellis, Emerald Isle, and So Safari – Zebra. Designed in Sweden and made in Europe, DockATot provides the ideal hygienic microclimate that mimics the womb and helps prevent flat head syndrome and SIDS. Thanks to the perfect marriage of style and functionality, DockATot has been flying off the shelves and in demand around the world. It’s won awards such as the prestigious Junior Design Award, NAPPA and The National Parenting Center. DockATot retails for $185+ online at dockatot.com. Improve the quality and duration of baby’s sleep (including preemies and high risk), regulate body temperature, and also reduce the risk of hip dysplasia and other hip problems associated with swaddling with the award-winning Ollie Swaddle. The Ollie is named after and invented for a baby boy named Oliver—a foster baby that wasn’t thriving until Ollie Swaddle founder (and his foster mom) Hindi developed it. It can help keep baby in a safe, supine sleeping position and prevent sudden jerky arm and leg movements that wake babies up. Fabrics that retain too much heat will only be uncomfortable at best and dangerous for baby, at worst. A baby’s body isn’t yet set up to regulate their own temperature perfectly and their small size means that they can quickly become overheated. Ollie Swaddle features patented moisture wicking fabric to keep baby dry and regulate body temperature, preventing the risk of overheating. Ollie Swaddle can also reduce stress in preemies and high-risk infants and ease the pain of colic. The elasticity allows for freedom of movement while the opening at the bottom makes it easy to change diapers. The new Nature Collection features four calming colors—Lavender, Sky, Nest and Stone. Retails for $59 online at theollieworld.com. Lorena Canals rugs are eco-chic, healthy, safe, all natural, machine washable, and ideal for any setting where kids live and play, made from the best materials that allow babies to experience the world around them in a safe, healthy way and with no threat to themselves or the world around them. Lorena Canals rugs are unique because they are handmade in India using all non-toxic dyes and 100% natural raw materials. On the other hand, many rugs contain VOCs (which contribute to health issues) and are treated with stain protectors, fire retardants and moth-proofing insecticides. Most synthetic rugs are also backed with a latex mix containing styrene, which is a possible human carcinogen. 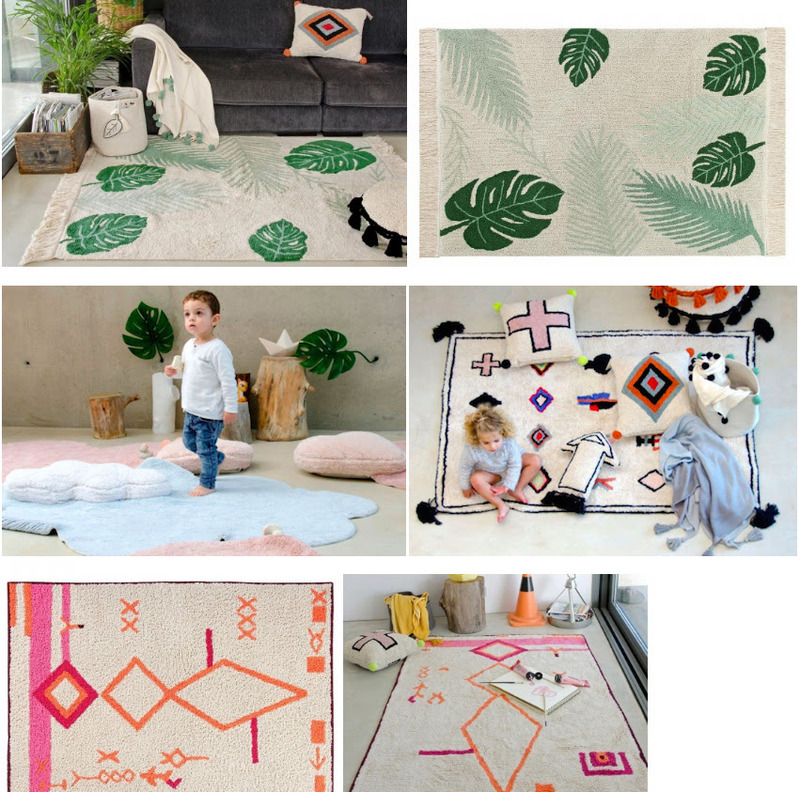 Families love the functionality of Lorena Canals rugs, made to be used, walked on, played on and truly play an integral part of family activities! And the stylish designs make them ideal for bedrooms, nurseries, playrooms, family rooms, and beyond. Lorena Canals also finances the education of over 100 children in northern India, giving them the opportunity to decide their future. You can see the entire line online at lorenacanals.us. Parents of tots know that buying all-natural clothing and toys is key in helping to keep baby safe and healthy. Finn + Emma manufactures all natural baby clothes, toys, and gifts that are all free of toxic chemicals and made from organic cotton & sustainable wood. The Earth-friendly, non-toxic, and fair trade gifts all feature modern baby prints and colors and the perfect balance of stylish and sustainable, classic and contemporary, whimsical and sophisticated. From wooden teething rings to plush rattle made with organic yarn, to soft & eco-friendly baby fashions, Finn + Emma is playing a great part in keeping toxic chemicals at bay when caring for baby. You can see the entire line online at finnandemma.com. No matter where your travels take you and your family this summer, be sure to remember to pack your BubbleBum! 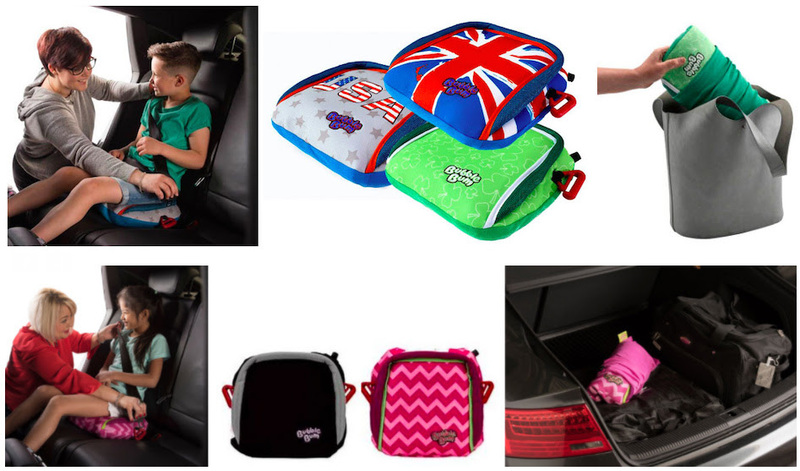 BubbleBum is the original, inflatable car booster seat for kids 4 – 11 years of age (weight: 40-100 lbs) that makes traveling so much easier and not to mention fun! Whether taking a road trip or flying to a distant destination, car rentals, taxis and Uber/Lyft rides are a breeze with BubbleBum. No need to lug a heavy, cumbersome booster everywhere! The easy to pack air cushioning of the BubbleBum seat keeps kids comfortable and safe on all car rides! Available in the brand Union Jack, Luck of the Irish, and Stars & Stripes designs, as well as black and pink chevron designs. Parents can rest easy that their precious cargo are sitting properly in the car, with the seat belt placement where it should be, across the things, instead of it sliding to the abdominal region. A high velocity accident with the belt in the wrong place can cause serious injury! Perfectly design for travel, this booster seat, which weighs less than a pound, is easy to inflate and deflates in just minutes, ready to throw into your luggage or tote bag! Available for $29.99 online at bubblebum.us. 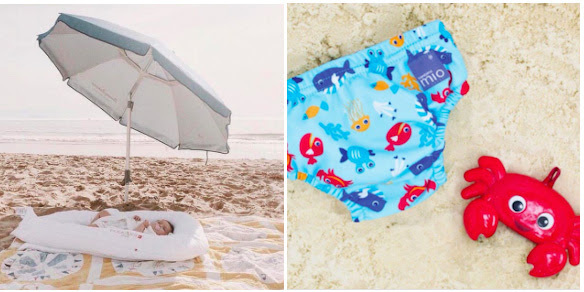 Bambino Mio’s cloth swim diaper essentials are made with natural materials and are perfect for a day at the hotel pool or beach with baby. These chic and eco-friendly swim diapers will help families live greener lifestyles this summer and beyond! Keep your baby trendy while they tread the water with Bambino Mio‘s award-winning reusable swim diapers. Easy to use, they are the ultimate solution for your baby in the water, as no additional diaper needs to be worn with this product. The drawstring waistband means it’s easy to put on, comfortable and secure. Made from a soft, lightweight fabric that doesn’t weigh your baby down in the pool like disposables. Bambino Mio’s award-winning miosolo all-in-one diaper is another great way to keep baby clean, dry, free of chemicals associated with disposable diapers, and happy while out and about this summer. It is a simple, stylish and super soft all-in-one cloth diaper that is as easy to use as a disposable! The size of the diaper can be changed using the adjustable snaps and velcro style fastenings to suit the shape of your little one.